I just finished the third book in Lisa Shearin’s SPI files. They are so fun. I read the first one, The Grendel Affair, when it first came out. I bought the second, The Dragon Conspiracy, and then somehow forgot about it. 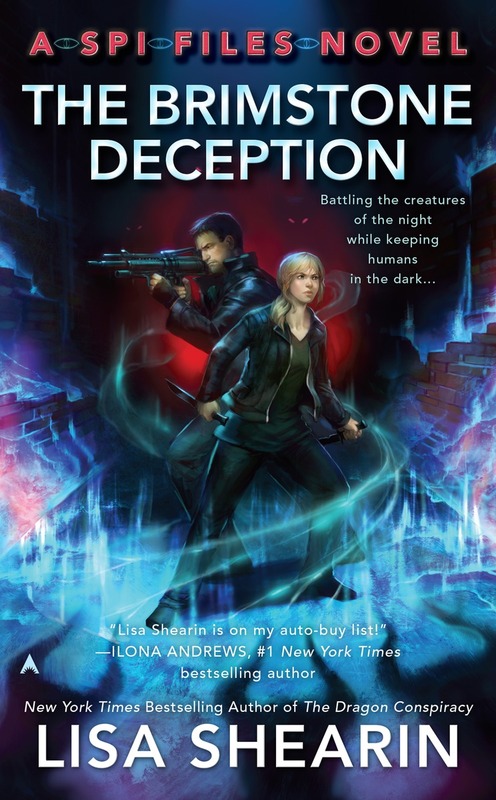 Then The Brimstone Deception came out last month and I realized I had some r eading to do. The happy thing is that I had two to read back-to-back and that was so fabulous. The unhappy thing is that I don’t have another to chew through. Damn. Anyhow, the SPI books take place in New York City and revolve around a supernatural non-official police force. There’s a lot of police procedure, adventure, snark, and a hint of romance. The character interactions are just so much fun. Smart and funny and serious and in the latest book, you get to meet the great great great . . . grandaughter of the witch who built Hansel’s and Gretel’s gingerbread house. Only Kitty’s not a child-eater. You’ve got a wide cast of characters, and a variety of cool stuff going on. I really recommend you just go get all three, stock up on some munchies and your drink of choice, and hunker down for a good long, lovely read. Really. And then, because she’s just so much fun, watch Jeanne Robertson. A very fun, very clean comedian. You’ll laugh. I’ve been in the mood for some light romance and some Christmas reading. I don’t know why. It’s not even Halloween. Maybe it’s because of the recent shooting here in Oregon, and I just needed some happy, sappiness. 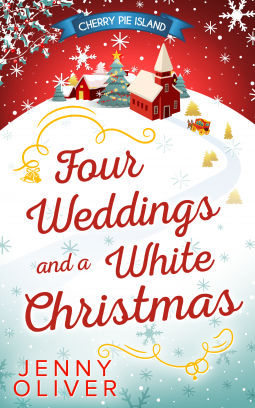 Four Weddings and a White Christmas by Jenny Oliver was a pretty fun read and generally I liked it. The key thing is that it was really light and not a lot of deeper emotional stuff. So the story, as you might have guessed, revolves around four weddings and a snowy Christmas. Set mostly in England with forays to New York City and France, the story revolves around Hannah, a newly-graduated dress designer, who is reconnecting with old friends. One of them saw her graduation project and asked Hannah to design her wedding dress. Hannah, a single mother of a five year old girl, both living with her parents, is looking to have a life and develop her career. She’s eager to reconnect with old friends and that is one of the key elements of this book. At the first wedding–rather right before–Hannah and Harry meet. He’s a top chef in a New York restaurant. He’s not looking for romance any more than Hannah is. He grew up in a strained household and is struggling to figure out how adult Harry connects with his parents and sister. Harry and Hannah meet infrequently, mostly at the events of the title (very much like Four Weddings and A Funeral). Harry discovers he’s attracted to Hannah and to her daughter as well. He’s not as anti family as he thought. However he can’t bring himself to want a real relationship and Hannah is working to hard to find roots and a stable life for herself and for her daughter. Even so, they grow closer, and then Harry’s world falls apart when his estranged father dies. Hannah gets offered a hug opportunity and struggles with finding her feet. In the end, of course, as in all romances, the two find their way to be together. What was fun about this book was that it focused more on the people growing and changing and as a result, and part of the process, they discover each other. This is a ‘sweet’ romance, with no sexual situations. I’d definitely recommend this one. I did enjoy this book for the most part, though I stumbled over some things. First, When Barret’s buddy pulls his stunt and Barret disappears, Jamie forgives and forgets that for the most part. I’m just not sure that she would. That seems to be a significant relationship problem. It doesn’t bear a lot onto to the overall story, but it did bother me throughout. The other thing that bothered me for a long time (though the thread finally came back in) was the beginning bit. 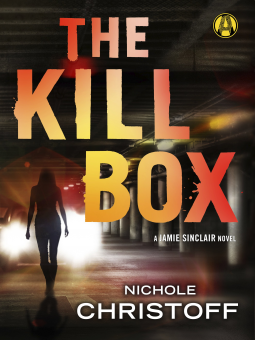 Jamie is involved in a police operation, and after, she comes home to the hostage scene described in the beginning. That initial scene seems to be important, then simply vanishes from memory. It seems to have no purpose. Eventually it came back, which was nice, but until it did, it bothered me. I also didn’t like the resolution. The bad guy. The murderer made sense. But I had a little bit of trouble buying the conspirator and mastermind of the uncovered drug operation. That all seemed to come out of the blue and again, I just had a hard time buying it. However, I really liked the way Christoff built the mystery and revealed the clues. I liked the various characters in the town and the difficulties between Barrett and Jamie. I also like the complications from the old murder and the town’s law enforcement. I did like Jamie as a character, and Barrett grew on me as more of his past was revealed. I could see why he didn’t open up very quickly. I enjoyed the book. I thought it was a good read overall. The ending was a bit disappointing, but I’ll definitely pick up another book of Christoff’s. I’m way behind on book reviews. Way behind. I counted. I have at least nine books that I’ve read and haven’t yet written my reviews. Some of the books were really good, some less so, some really less so. I’ll be working on getting those posted over the next couple of weeks. In the meantime, I hope you’re reading some fantabulous books. 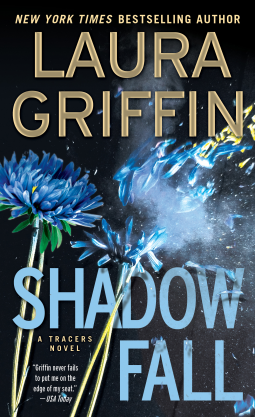 Laura Griffin’s Shadow Fall is the latest in a series that I really adore, and this one is no exception. I can’t remember when I first started reading the series, and honestly, I began in the middle (these are stand alones even though some characters overlap and some history is recalled.) They are mysteries and romance. The women are smart, the men are smart, and the mysteries are smart. There’s not a lot of mansplaining or even as-you-know-Bob’s. I find that fairly unusual. I liked the romance in this book. Here’s why. I felt that it built naturally and not just insta-love without any basis in respect or knowledge of the other person. Don’t get me wrong. I believe in instant attraction, but to feed it, you need people who are interesting, likeable, and who you can believe match up. Tara and Liam both do. The mystery was well done. It wasn’t obvious, but neither was it out of the blue. I hate WTF? mysteries where you never see it coming and you don’t believe that resolution makes no sense. The tension isn’t just the romantic. There’s the difficulty of the politics of the town and of the law enforcement community. I love the density that gives the story and the way it completely weaves through the other two story lines. Griffin balances all the elements and then brings it all together in a natural crescendo that feels right without being predictable. I received this book from Net Galley. After reading Jane Casey’s The Kill, I was curious about Hide and Seek. I wondered how her writing skills would translate into writing YA, so I was eager to read this book, and I really liked it. I thought it was engaging, with a cool mystery and a good twist. The interweaving of the secondary characters and their relationships really made the story robust. The book is set in England. Jess Tennant is a teen. I’m not entirely sure how old she is, but I’m guessing seventeen or so. She’s living with her mom and her aunt and uncle. In a previous book, her parents apparently divorced and they moved back to her mother’s home town. Jess is really happy, especially because her mother is happy. So the fact that her father has moved to town to get back together with her mom worries her. Her father is portrayed as selfish and he cheated on his wife, as well as demoralized and attacked her sense of worth. In other words, he’s not been a great dad or husband, and Jess doesn’t want anything to do with him. A complicating factor to all of this is that her mom and a local police detective were teenage sweethearts. They had some sort of difficult breakup years before that led both to unhappy marriages. Now both his wife and her ex-husband suspect that they are getting together again. They aren’t the only ones. This is a complication for Jess, who is dating the policeman’s son. She and Will are deeply in love, but have a tendency to argue and fight. He’s been away at school and has just returned for the Christmas holiday. The story begins with Jess at a party. At that party, Gilly, a schoolmate, seems to have been cornered by some other girls who are trying to get her to talk about something. Pretty quick, Jess tries to step in. Gilly ends up breaking a glass and deliberately cutting herself, even as several people around her make curious comments. Later that week in school. Jess’s history teacher is making a project assignment and oddly, Gilly refuses to work with her assigned partner. Jess–who has nosy detective sorts of tendency–is instantly curious, especially after the weekend party. She ends up assigned to work with Gilly. Despite asking several questions, Jess is no closer to finding out what’s going on. She makes plans to meet with Gilly later in the week to work on their assignment. Gilly never shows up. The rest of the book focuses on the hunt to find Gilly. Did she run away? Was she killed? Kidnapped? There are a variety of possibilities and Jess is determined to find out what happened. On the way, she has to deal with her boyfriend’s police detective father, her own father, and the drama of her own life. She’s caught up in trying to decide who she is, who she wants to be, and whether or not she should follow the rules. The mystery in the book was really good, as was the interweaving of Jess’s personal life. I thought some of the backstory could have used a little more bolstering. I know there are a couple books earlier in the series and I felt that reading them first would have made this book a lot better, especially understanding the relationships between the major and secondary characters. I also was a little confused on Jess’s relationship to her cousins, particularly Hugh. At times she describes him as if he’s threatening, and yet she loves him and seems to feel she has a really great relationship with him. I found that confusing. Another thing I found confusing was the relationship she had with Will. That could have used a little bit more from previous books, too. It made sense going deeper in, but at the beginning, I wasn’t sure what sort of relationship they really had. At first they are totally in love, but then he turns angry and cold and dismissive. It’s very hot and cold for reasons I can’t see, possibly because the foundation is laid in earlier books. Another thing I found odd was that the adults didn’t seem to mind Jess’ and Will’s pdas. Especially later on when it’s happening at night. There simply was no comment and no interest in what they were up to, and I found that odd. Especially given the foundation of unwanted pregnancy, it seems odd that only Will’s father says anything at all. Despite those minor drawbacks, I enjoyed the story a lot. I figured out what had happened pretty quick, but I didn’t see the twist coming, and I was surprised by Jess’ father at the end. I’d like to read the earlier books in the series. Jane Casey is a hell of a writer and I definitely recommend the book. received this book from NetGalley. And while I’ve seen it referred to as a Temeraire book, it’s not. It comes out May 19th, I think. Uprooted is a total keeper. It reminds me of books by Patricia McKillip and Robin Mckinley, and that’s a serious compliment. It’s a kind of a fairy tale, the kind the Grimms might have told. The language is both plain and lyrical. The book celebrates magic, but it’s not a light book. It has a lot of darkness, both of magic and in the souls of people. It’s a story about choosing who you want to be, and right and wrong is not easy to choose or know. I loved the magic–and there’s a lot of it. It’s a rich story with rich, deep worldbuilding. Agniezka (and I’m probably butchering that name) is a wonderful character. She’s young and foolhardy, yet wise and brave. She’s loyal to a fault. The other characters are less developed and maybe a little thin. I didn’t have trouble with that, because it fit with the fairytale nature, and they were full enough for me, plus Agniezka is well-developed. One complaint I have is about Dragon. While I can see why she comes to like him–whatever he says, his actions show loyalty, friendship, and kindness, even as they frequently show the opposite–I wanted him to have a few more signs of likeability. Possibly more demonstrated emotion aside from annoyance, anger, and frustration. The book is very complete and stand-alone, though I’m hoping for more to come because I love the world and the history and I want to know more. I don’t want to offer spoilers, so I’m not going to go into more specifics, but I totally recommend this book. It’s delicious to read and I didn’t want to put it down. Absolutely worth the time and money. This is one of those books that makes you think. It makes you consider what you’d do in the same situation, and it makes you consider what choices you’d come to–what would be the most important thing to you. I don’t want to give spoilers, so I’m going to try to be careful. I plan to err on the side of vague. The book is about Em, who wakes up in a coffin. She breaks out and discovers she’s in a dusty room with several other coffins. She doesn’t know her name. She has some memories, but a lot of blank spots. She soon finds several others in the same boat, and now they have to find out where they are, who put them in the coffins, and most importantly, find their way home. One of the things that some people will find off-putting is that the story is told in present tense. Normally that would drive me nuts, except that the present tense makes a lot of sense because it works well with the element of discovery. Em is constantly discovering things–she has little sense of the past or the future, so the present is where she lives. All her decisions have to be based on the now because she has no experience or any sense of what the consequences might be. It makes her situation tense, to say the least. I enjoyed the story. It was gripping and at times grim. It didn’t shy away from the difficult aspects. In fact, it embraced them, but focused more on the personal consequences of the choices and the events. Each character has to learn who s/he is. This is a story about identity. What makes it unique is that the identities the characters have no outside references to decide who they are, or what they should do or not do. This means they are stuck with making decision based on simply who they are without any external guidance or pre-existing framework of morals, except for a handful of memories that aren’t all that useful. The book raises a lot of meaty themes. The question of nature vs nurture when it comes to personality and self. Then there’s the question of religion and what value it has. Leadership is important, and loyalty and friendship. When does the group outweigh the individual? There are questions of consequences and whether you can choose beyond your nature. My only complaints about the book are that the religious element comes a little out of nowhere. I wish it had been eased in a little more intuitively rather than just arriving. It made sense and fit perfectly as the story went forward, but the arrival was awkward and unexpected. I also thought the leadership quandary was a little bit heavy handed, though a lot of it made sense and the doubts were important as well as the choices eventually made. Especially in light of the fact that they were based on the here and now and what logic the people could scrape together. There was no way to predict consequences and that made choices really scary. Another oddity, to me, was the basis in Aztec/Mayan culture. I wasn’t entirely sure why that was the case. I also wanted to know how and why the monsters appeared as they did–I won’t say more, since that would be spoilerific, and it really isn’t very important to the story, but just something I’m curious about. Once several revelations/discoveries are made, the development of the relationships become more interesting and important. I don’t want to say much more because of spoilers, but just that there were some really cool and smart developments between the characters that blossomed in unusual ways by the end of the book. Also, it was fun how Sigler mixed races in this book in unusual ways. I’d totally recommend this book. I am hoping there will be a sequel. I’m totally going to have my kids read it. Hi folks! Happy first day of 2015!! John is a writer. A good one. An entertaining one. I downloaded his recent The Black Knight Chronicles omnibus a couple weeks ago, and then he generously offered to let me read “Raising Hell,” his new novella. This is a story of Quincy Harker, who is a wizard, and who exorcises demons. His uncle is Dracula, and he’s got a guardian angel named Glory. He’s a smartass and while John points out the story isn’t funny, Quincy certainly has his funny moments. Morbid, but funny. So anyhow, if you can’t tell, I really liked this story. As in, read it fast and then started chomping at the bit for more. Which means I”ll be tackling that omnibus first thing this new year. 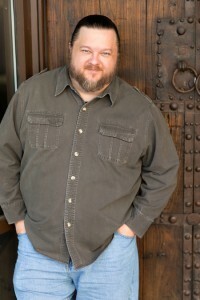 So most people, if they know me at all, know me as the funny horror guy. Or just the funny monster story guy. And that’s fine with me. After twenty-plus stories in the Bubba the Monster Hunter universe, and five novels in The Black Knight Chronicles universe, I’m pretty comfortable being funny. Until I’m not. And sometimes I’m not funny. My short story “Fair Play,” which was included in The Big Bad anthology last year – not funny. Frankly, that story creeped me out a little, and I wondered about even publishing it. But then I decided that I liked the story a lot, and ran with it. So I’m not always funny. Quincy Harker is not a funny man. His is not a funny series. It’s a dark world, more Batman than Elastic Man. Way more Tim Burton than Tim Conway (you young’uns go look that up). So this series isn’t funny. Sure, there are a few chuckles, a few one-liners. All my characters will have a certain level of snark to them, ‘cause how else could I write dialogue? But there’s a real level of danger with these stories. I don’t have much faith in the forces of good triumphing in these books, and bad things are going to happen to Harker and his cohorts, things that they might never recover from. So why go there? If I’m happy being the funny dude, why go all grim on everybody? Well, for one thing – comedy doesn’t sell as well as the dark stuff. Funny stories are a weaker sell, and that’s the business part of writing a darker, grittier series. For another thing, I’ve never felt like I was only one kind of writer. I have a lot of ideas, and a lot of characters running around in my head, and some of them are pretty ugly. This series gives me a place to explore those darker nooks and crannies, and that’s part of the artistic side of writing a new series. But the main reason I decided to write a darker series, featuring a part-vampire pseudo-immortal wizard is the same reason I write everything – the voices in my head wouldn’t shut up until I told their story. Quincy Harker needed to come out, to live on the page, and he wasn’t going to leave me alone until I wrote his story. So I did. 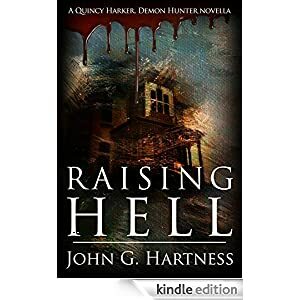 The first novella featuring Quincy Harker is called Raising Hell, and it releases on January 20. I hope you’ll click the cover below and pre-order, and I hope you enjoy it! I slept late today. Totally lazy. Let the kids sleep in. Let the dogs sleep in. All were happy. Also, Voodoo managed to eat all his brother’s dinner tonight, for no good reason. There had to be a Costco run today, to stock up on all those things that we’ve been running out of, but which seem important, particularly milk and toilet paper. Boy of size was very ill today (bad day for him) and so girlie and I headed of. The man went hunting, though fruitlessly. Sads for that. Would like some venison. 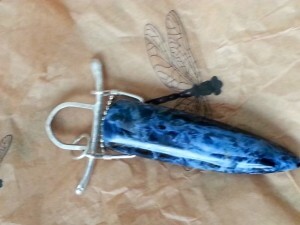 So anyhow, on the way, stopped for some chai and got a text my friend that she’d stopped by at the Saturday market and that my pendant was ready, and should I not come soon, she’d make off with it. Ahem. So off we went there first. 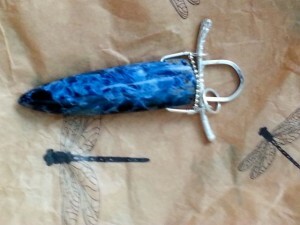 A couple of years ago, I bought this really cool stone for a pendant. It had sort of a tigereye/flame look, all in blues. I loved it. It had a hole drilled in the top and I thought I’d try to get a setting made for it to wear. I love the work of this woman I met at the Saturday Market. She and her husband have a booth and have marvelous rocks. She does the jewelry side. Anyhow, Nadyra, who rarely does commissions, said she look at my rock. I brought it over and both Peter and Nadyra were just excited. Apparently I had a really nice piece of Namibian Pieterite, which is not that available in the US, and this rock is particularly fine. Also, the hole through it is hard to drill. Nadyra agreed to do the setting for me. Here it is. Mind you, I took a crappy pic with my phone, but you see the idea. Isn’t GORGEOUS? She did a lovely job. So thrilled. I need to take a better picture. The stone is just amazing. It’s probably 2-3 inches long. Isn’t it ridiculously lovely? I can’t tell you how pleased I am with it. I have the perfect chain for it, too. After mooning over it, we went to Costco where we overfilled the cart and I got a soundbar with surround speakers for the TV. I’m so hoping this fixes the fact that I simply can’t hear voices half the time. But getting it hooked up properly–that was a tiny, little bit aggravating. Still haven’t figured out how to configure the TV remote to run the speakers. I’d like to do that. I also have been rereading Wen Spencer’s Tinker, a book I’ve loved for many years and continue to love. If you’ve not read it, you should. It mixes magic and science and Quantum Physics and elves. It’s amazing. Love it. I made it home from Colorado. The teaching was a lot of fun, but exhausting with all that was going on. Sadly, a good friend died on the same day I came home. She’d been fighting cancer for some time, and she let me know when I was in CO that she was going into hospice. I had a chance to say those things you always wish you’d have a chance to say to someone you love before they are gone, which I’m glad I did. I’m heartbroken, for her family and myself. She was younger than I by several years, and her daughter is younger than mine. We are hoping to go to MT in a couple weeks. I’d hoped to see Laurie then, but it wasn’t to be. I’m hoping we can see her family. That brings me to the next bit of news. We went to see the specialist for boy of size today. He’s had up and down days. He was feeling pretty good today. The doctor wants me to take him off most everything he’s on–herbal and not–except for omeprazole and Ondansetron–and she’d like me to wean him off the latter as much as possible. Just about everything he’s been taking either lose effectiveness after awhile, or begin to cause the problem you take them to prevent, ie. vomiting. Peppermint is one of these, so is ginger root. This means vomiting could increase, but hopefully it will subside. He’s supposed to avoid fructose, which can cause stomach upset in these circumstances. He can have fruit, but not fruit leather, juice, and that sort of thing. So things could gt really ugly. I hope my heart can take watching him suffer. In the meantime, I’m trying to get caught up on life from being gone. I have to get my own blood drawn for my annual physical sometime soon. I need to call and arrange the blood draw. I’m also trying to get writing done. Lots and lots. Trace of Magic is up for preorder on Amazon Kindle. Other formats will be coming soon, including print. I’ll let you know more. I’ll maybe nag you to pre-order. Tell your friends. All that sort of thing. It’s food time now. Going to go put something together for the family. Also, I read Michaela Roessner’s Walkabout Woman. It’s phenomenal and like nothing you’ve read. Go read it. Seriously. And I’m currently reading The Golden City by J. Kathleen Cheney. I’m loving it. Definitely recommend it already.